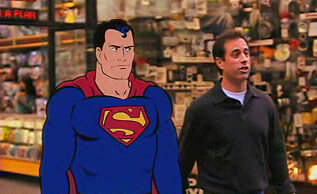 Comedian Jerry Seinfeld has long been known to be a huge fan of Superman. 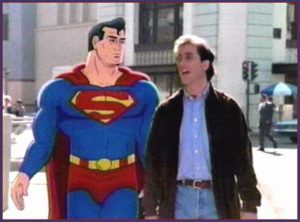 Contrary to urban myth, Superman references do not appear in every episode of Seinfeld but are prominent in many of them. American Express began partnering with Seinfeld in 1992 in an effort to re-brand itself away from the perception that it was just for older, wealthy consumers. Seinfeld attracted a younger, “hipper” demographic without alienating existing cardholders. AmEx was looking for a commercial to air during the January 1998 Superbowl Game that would attract some attention. Seinfeld pitched the idea of appearing with Superman and arranged for a lunch with an executive at Warner Brothers in October 1997 hoping his celebrity status would seal a deal. Filming began in November for a thirty second and sixty second version of the commercial. The animation of the Superman character was done by the Warner Bros. Classic Animation division. 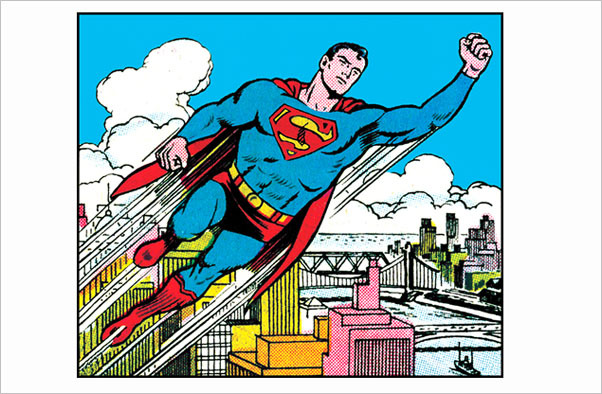 Seinfeld specifically asked that the hero be drawn in the classic style of artist Curt Swan who was the premier comic book artist on the character from the 1950s through the 1980s. The live-action was shot on pin-registered 35mm film on the set used for the Lois and Clark television series on the Warner Bros. lot. Seinfeld rehearsed his blocking with actor Patrick Warburton who played the role of David Puddy, Elaine’s boyfriend, on the sitcom and would provide the voice for Superman. Creating the animation and compositing with the live action took several weeks. Kathleen Helppie, a vice-president at Warner Bros. said that 56 artists created over 12,000 hand drawings of Superman on paper. The animation included several levels of effects animation including not just the regular tones but half-tones, highlights, special effects and more. More than a thousand individual photos from the live action were generated as backgrounds for the hand drawn elements. Warners also created mattes for live-action cars, props and people that are located between Superman and the camera “allowing us to put Superman behind particular objects like a car,” added Helppie. The live-action film and individual drawings were scanned into computer, composited and digitally painted. All painting and compositing was done using various modules of ToonBoom’s USAnimation software. The commercial done by Ogilvy & Mather Worldwide in New York ran during the football playoff games on Sunday on NBC and Fox in early January and then later that month during the Super Bowl XXXII telecast. A 60-second spot during the game cost $2.6 million. Seinfeld wrote his AmEx commercials with Chris Mitton, Christian Charles and Dave Laden. Superman: I mean, it’s not like I asked to be famous. Seinfeld: Yeah, well it’s the price you pay. Superman: You sign a lot of autographs? Superman: Some. They ask me to bend stuff a lot. Seinfeld: I can see that. Superman: It’s Lois. She’s in trouble. Seinfeld: Did you look through that building? Superman: Well, kind of. It’s glass. Lois: Superman. I’ve forgotten my wallet. Superman: I can’t carry money in this. I’m powerless. Old Man in store: What’s with the spinning? Superman: He idolizes me. It’s embarrassing. Lois (to Seinfeld): My hero! Man: It’s a huge comet hurtling perilously toward Earth. We’re doomed! Seinfeld (to Superman): I think you better get this one. Man: Wait! Could ya? It’s for my kid. Seinfeld was a huge fan of Jack Larson’s portrayal of Jimmy Olsen so asked for him to do a cameo and got an autographed photo. He spent time with Larson watching the Superman episode Panic in the Sky, a 1953 episode where Superman rams a giant asteroid on a collision course with earth. 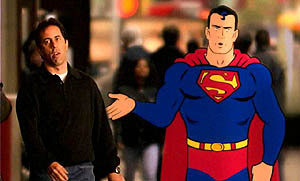 The original cameo had Larson encountering Seinfeld and Superman walking down the street. Larson holding a copy of a newspaper looks up and says “Hi, pal!” in reference to the comic book Superman’s Pal, Jimmy Olsen. However, after several different takes, it just didn’t look right. 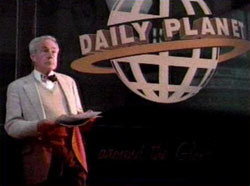 They took the footage of Larson looking up, removed Superman and Seinfeld from the scene and added the shadow of the approaching comet and the Daily Planet background. The idea of using the comet came from the television episode Seinfeld watched with Larson. The last episode of Seinfeld aired in May 1998, roughly four months after the advertisement first aired on television but Seinfeld’s relationship in promoting AmEx continued for many more years. It must be later commercials that I recall looking like early uses of Flash animation (nevertheless still funny). I didn’t realize the commercials were that long ago (1998), only discovering them online in 2007. I think both Larson & Noel Niell made a cameo together in a later commercial in this series. Yes, there were two later episodes which I will detail here next week. One of them had a short cameo with Noel Neill similar to the one here with Jack Larson….just long enough so they can be recognized by those “in the know”. Yes, they used Flash animation. I am only sorry more were not made. Superman does appear in every episode of Seinfeld in the form of a visible refrigerator magnet in his apartment. No, the magnet is not in EVERY episode although many, many people believe that as did I until I started doing research on both Seinfeld sites and Superman sites.